Hi there! It’s so nice to be visiting with you again. I hope you are having a wonderful day in your neck of the woods. We finally have warmer weather in Japan and I switched out my winter clothes for sundresses and shorts. Wahoo! 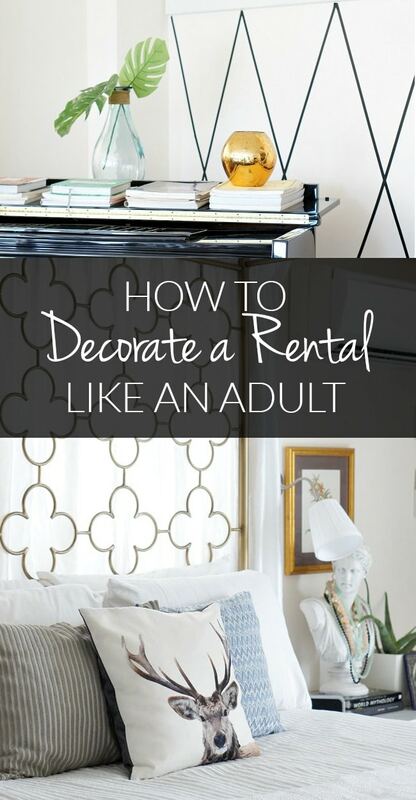 I so enjoyed sharing tips on how to hide eyesores in your rental a couple of months ago and today I’m excited to share the best steps for creating a chic and sophisticated home that your friends and family will swoon over. 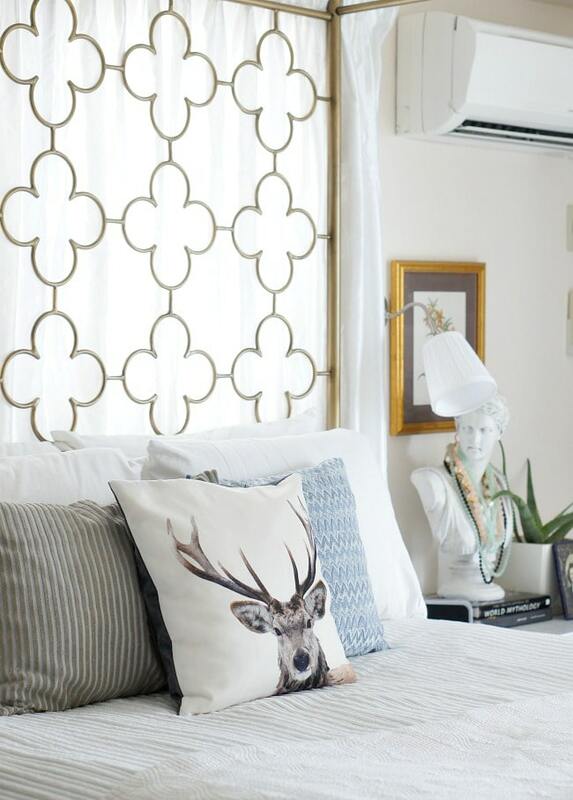 Tips for creating a well designed temporary space without spending a lot! Most of my friends are military spouses like me and often ask for help when decorating their temporary place. I often see matching sets of furniture, bland walls, and not much decor. 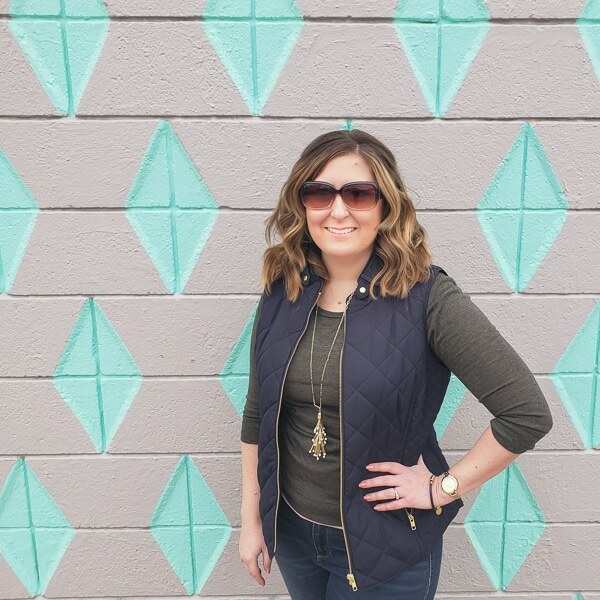 They are usually overwhelmed with how to create a home that feels more permanent without going over their often limited budget (and managing kids and deployments!). Here are the decorating idea I suggest for them. 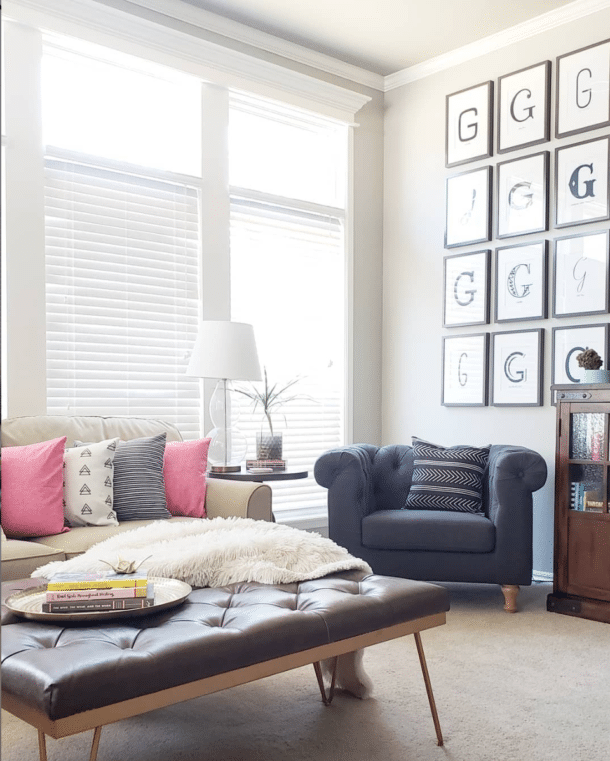 These rental friendly tips are easy to do and work with limited time and budget. 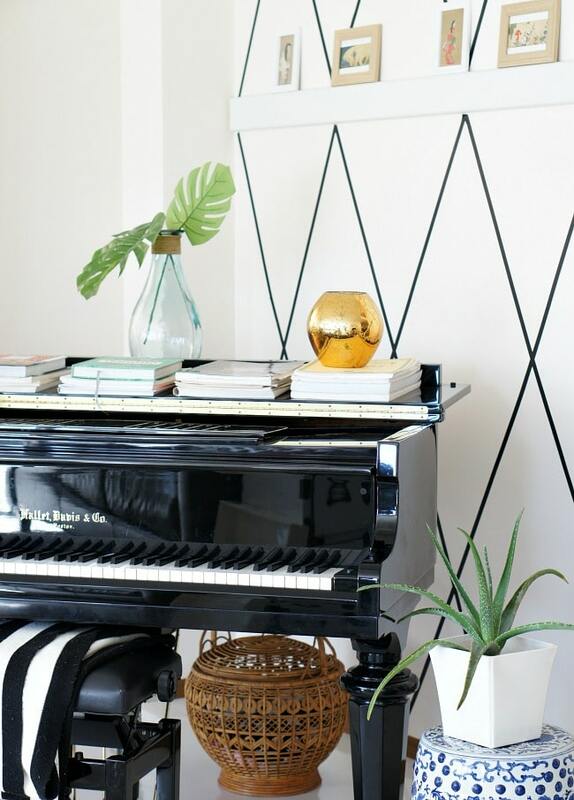 Painting walls is a great way to add more personality to your rental. If painting is not in the cards, try temporary wallpaper or a quick geometric design with washi tape on just one wall for a focal point. 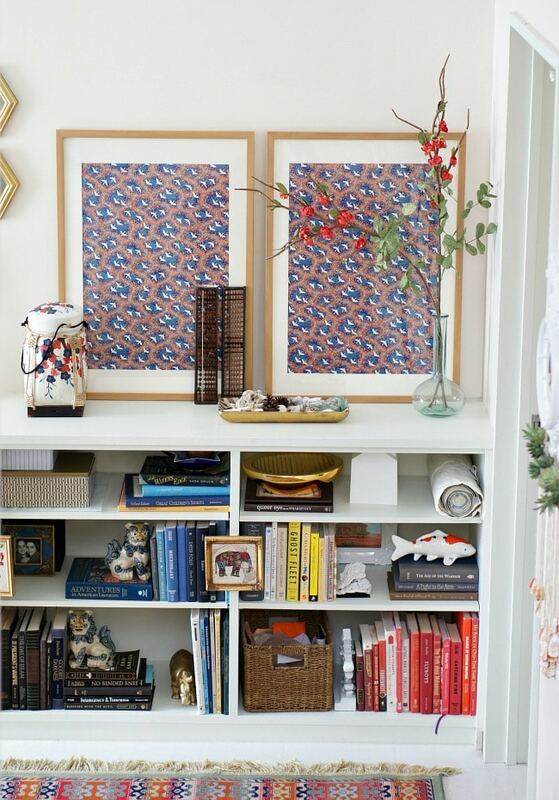 Opt for framing something that catches your fancy like a pretty patterned paper or book page instead of over-produced prints from big box stores. You will have something unique and special without a high price tag. Shop thrift stores for original pieces of art like student paintings or unknown artists. Use plants in your room. 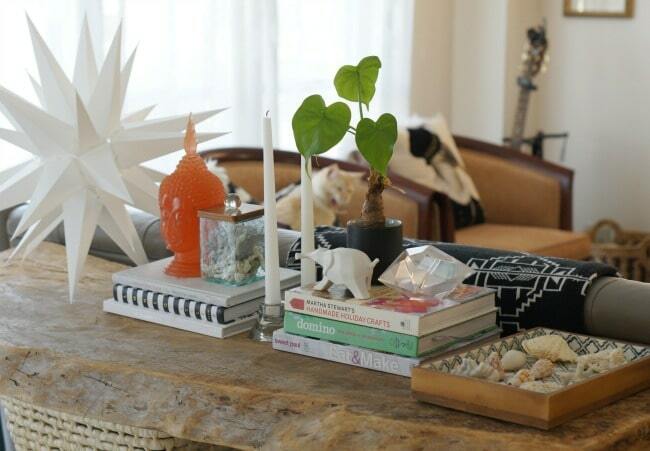 Plants are such a lovely addition to any space and make the room feel “lived” in. 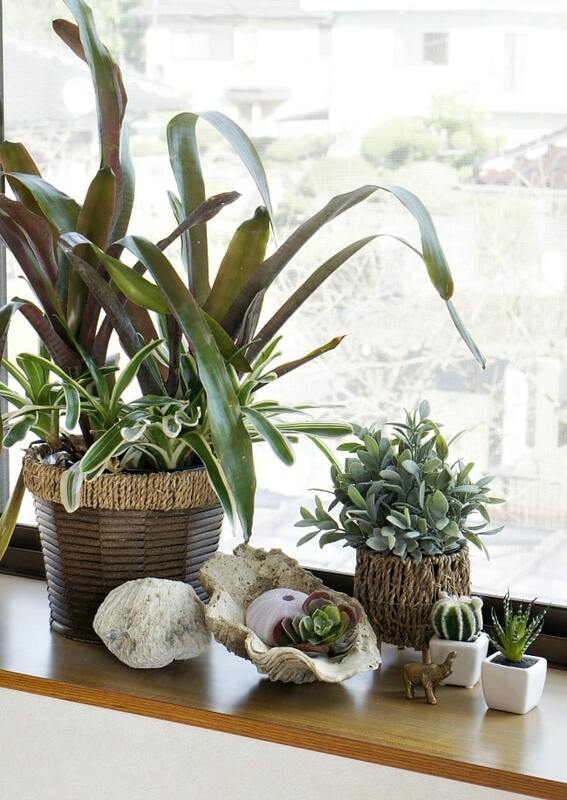 Try a couple of easy to care for plants like aloe, snake plant, or peace lily. You can also mix real with faux to maximize your plant decor. Not only are rugs great for hiding ugly floors but they are flexible in defining spaces or zones. 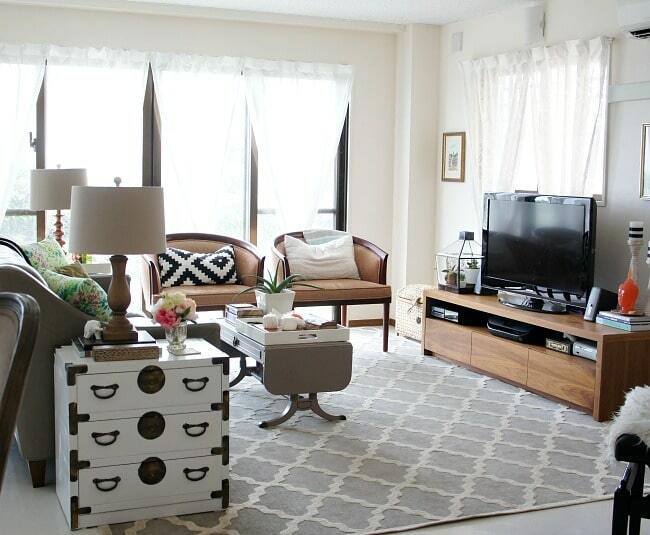 With so many great resources for inexpensive rugs, it’s hard to find a reason not to use them. 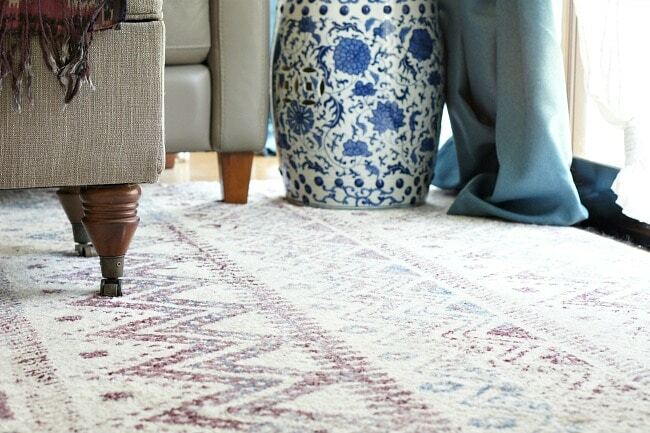 Check out this post for everything you need to know about type, size, and placement for the perfect rug (with shopping guides!). Hide cords under furniture and behind baskets. Rentals have a knack for outlets and cable covers being located in inconvenience spots. 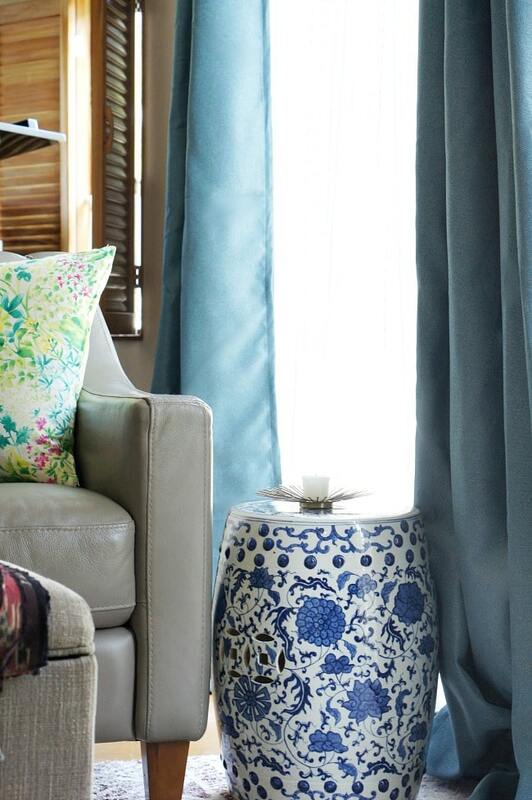 Don’t let that stop you from placing furniture in a functional arrangement or with good lighting. Just run those cords under furniture so they aren’t showing, just be mindful to leave enough breathing room for any heat from the cord to escape. Placing an attractive basket or plant in front of a mess of cables and cords is an easy fix too. Mix accessories from different big name stores, thrift and antique stores. Mix high and low with your decor finds. A brass figurine from the thrift store with cute candle holders from Target? Yes please. I love corralling decor items with a tray, basket, or book for a well thought out design. Also using something tall, horizontal, and sculptural together is aesthetically pleasing. Apart from painting walls, hanging curtains tall and wide are the easiest way to change a room and make it come together. Just make sure the curtains are tall enough to reach 3-6 inches from the ceiling and at least brush the floor. If it’s easier and more practical to keep vertical blinds and window blinds that are already in your rental, use extended rod brackets to cover them. Otherwise remove the blinds and store them until you move. An easy solution for dressing up rental cabinetry is to swap out the cabinet pulls for some that suit your personality. 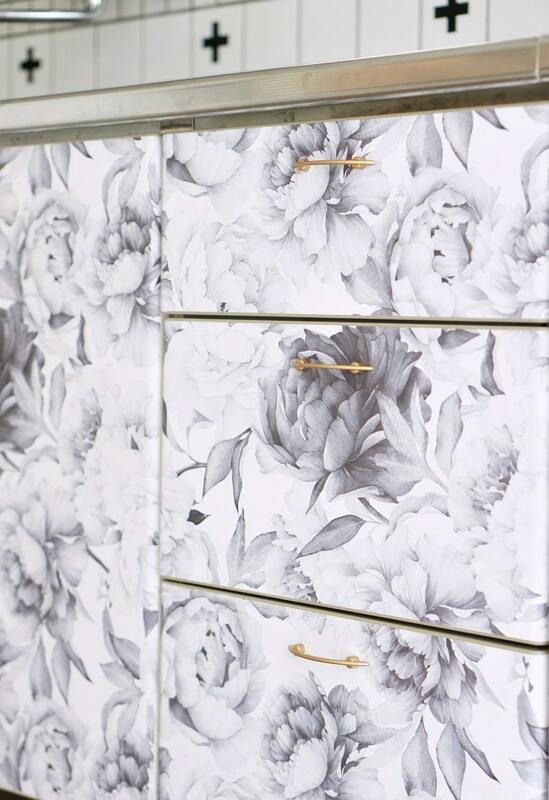 If you are really daring, add a pretty patterned contact paper or wallpaper to your cabinet fronts. Swap furniture from rooms to break up sets. Switch up those bedroom, dining, or living room sets by swapping with different rooms or painting a different color. White, taupes, and grays will look good with any wood stain when selecting a color. You will love how much more interest it creates in your room. Yay! Lighting is often harsh and limited in rentals. Consider changing out overhead lights for inexpensive stylish ones. If you find a high end light fixture that you are in love with remember you can take it with you when you move! Add additional lighting with table and floor lamps in your living room and bedrooms. 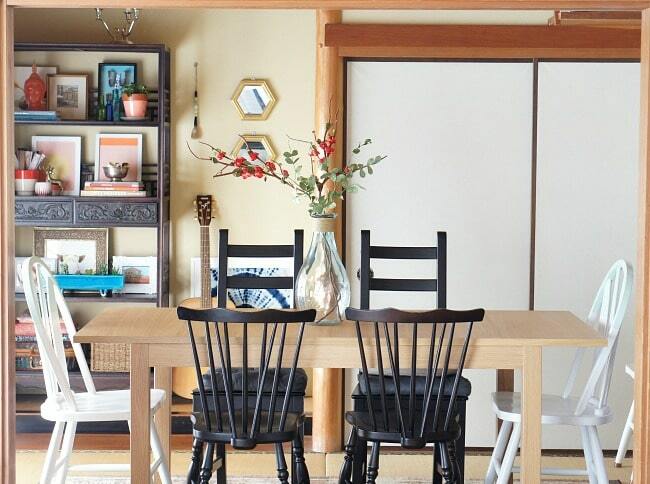 With these 10 decorating tips, you can turn any rental into a lovely haven to enjoy no matter how long you live there. Have you tried any of them? Love this, Kathy, and your post on hiding eyesores was amazing… Very clever. I’d love to know where you found that pillow if possible. Thank you for your great ideas!! Great tips!! Easy and they would make such a huge impact. Do you have any suggestions for reach in closets? Those sliding doors are such an eye sore for me. Not to mention, you are not getting the full storage ability with the sliding doors. I want to remove them… however, I have seen others and they look a tad sloppy. Kathy may have more ideas, but your question reminded me of this project one of my friends did: http://www.brightgreendoor.com/french-closet-doors/ and also this one that includes a photo of sliding doors turned to french doors: http://www.blueistyleblog.com/2013/04/OrganizedNurseryCloset.html Hope those help spur some ideas! I love Melissa’s suggestions! If the closets are deep, drawers (even a small chest) on one side might help with storage. Faux molding with washi tape, a fun paint color, or even removable wallpaper could dress up the doors. Please, please don’t run cords under rugs. I know it’s tempting, but it isn’t safe. Yikes, thanks for the heads up Peggi! I just updated the post to remove that recommendation and really appreciate you taking the time to comment and keep everyone safe! Thanks for the safety tip Peggi. I’ll be more cautious in the future.